“Judy Moody and the NOT Bummer Summer” is a movie filled with fun adventure and silliness that, while making the adults smile, will make the most importance audience members (children) laugh. If you know anything at all about books for elementary and middle school aged children (especially girls), then you are familiar with the very popular “Judy Moody” series written by Megan McDonald. 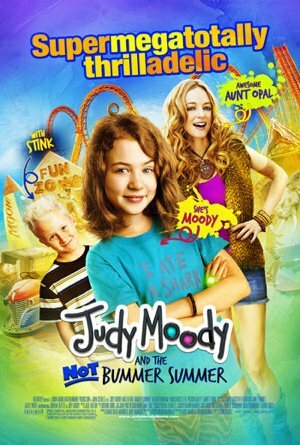 The movie, “Judy Moody and the NOT Bummer Summer,” is not adapted from one of the books, but is a screenplay based on the series. Co written by McDonald with Kathy Waugh, the film parallels the book series quite nicely is likely to please fans of the written work. Judy Moody, played by the adorable Jordana Beatty, is a third grade girl who has big plans for an adventure filled summer to be shared with her friends. Unfortunately, those plans soon go up in smoke when she finds out that one friend is headed off to circus camp and another is taking the trip of a lifetime to Borneo. Judy consults her Magic 8 Ball, asking, “Could this summer get any worse?” The answer: “Without a doubt.” Vowing to spend the rest of the bummer summer in her bedroom, Judy’s plan is soon interrupted, first by a minor mishap in the kitchen, then by a major change of luck with the arrival of her aunt. Heather Graham (“The Hangover” 2009) is suited beautifully to play optimistic, free spirited Aunt Opal. Her aunt’s presence inspires Judy to go ahead with her original plan of a summer spent earning what she calls “thrill” points. Instead of working as a team with her two missing friends, she turns it into a competition. However, when your competitors are at circus camp and in Borneo, you are certain to be the underdog. With the help of Aunt Opal and her younger brother, Stink (Parris Mosteller is very entertaining in this role), Judy’s summer is soon filled with one adventure after another, although not exactly as she’d planned. Director John Schultz (“When Zachary Beaver Came to Town” 2003) does a wonderful job of staying loyal to the targeted audience – grade school aged children. There is no effort to weave in bits of adult humor, leaving children to wonder what their parents are laughing about. While some might think this is a mistake, I applaud Schultz for making a film that parents can feel good about letting their children watch. I also like the way the movie is filmed. Its use of bright colors and animated daydream sequences give it a magical, cartoony quality. It is very fast paced and, at times, almost frenzied, which fits perfectly with the Judy Moody character. Judy Moody is the Pippi Longstocking of my generation. She wears clothes that don’t match, shoes that don’t match, paints every toenail a different color, has red hair with an untamed curl on top, and is absolutely unashamed of any of it. She is a collector of pizza tables, a Magic 8 Ball believer, a leader, a planner and an all around go-getter. The character of Judy Moody is one that will inspire young viewers to grab life by the horns. Without question, I recommend taking your grade school aged children to see this movie. If they read the Judy Moody books, they will enjoy seeing her come to life. If they don’t read the books, they probably will after seeing this movie.